Most of the time when people mention something is going to straight to video you consider that an automatic recommendation...to not see the film. Direct-to-video for years have mostly represented cheap, uninspired fare that wouldn’t entertain a blind chimp. Most of the time these are movies that are sequels to popular movies, but they are sequels where the original star, director, or screenwriter decided not to commit so the studio put something cheap out there hoping to make a quick buck off a popular name. Several years ago Warner Bros. and DC Comics looked at their library of comic legends and decided they wanted to tap into them. Not only would they get live action movies they would get direct-to-video films. Unlike most direct-to-video films though these movies were intended to be good not bad. Some of them have been good and some have been less then good, but none of them have escaped their direct-to-video feeling. 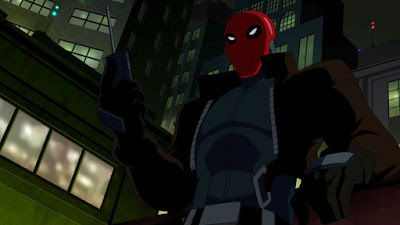 Now we have “Batman: Under The Red Hood” which not only strikes as a film that could have worked in theaters, but it’s a pretty impressive effort regardless how you look at it. The story is an adaptation of one of the more popular Batman serials and I think many fans will be pleased by how faithful it is. 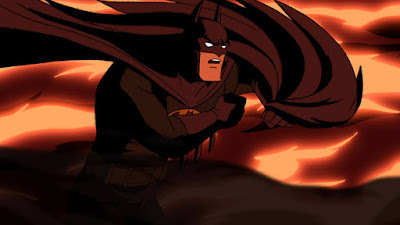 The story revolves around Batman trying to solve a mystery that involves a string of murders. There is a new villain in town calling himself the Red Hood and he seems to have all the mob bosses in his grip. Not only that but as Batman soon discovers, a one-on-one fight does not wield favorable results for him. There’s also a subplot about Batman feeling guilt over a failed attempt to stop the Joker from murdering Robin. Kid friendly this film ain’t. I know most of the DC Comics direct-to-video films get PG-13 ratings, but this may be the first one to actually earn it rather then to get it for show. It’s bloody, dark, moody, scary, and just a little psychotic. Without giving too much away the movie deals rather frankly with the fine line Batman walks everyday when he does what he does. 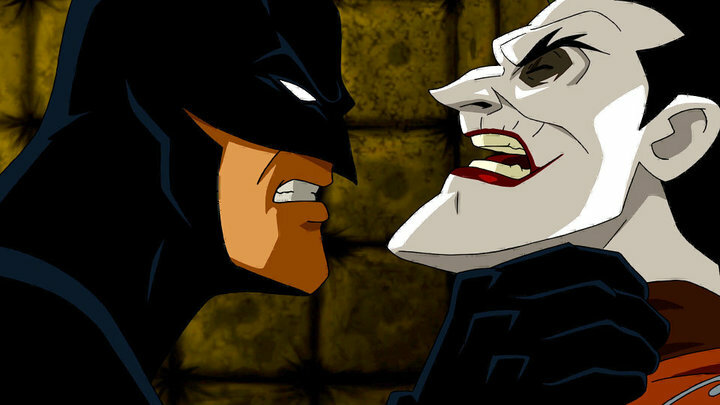 “The Dark Knight” explored similar themes to a better degree, but it’s still these themes that work best in the Batman universe. The climax ends not with an epic showdown but with a battle of principles and emotions. For direct-to-video it’s pretty deep. If there is one flaw to the film I guess you could say that the mystery behind the Red Hood is pretty obvious early on regardless how you look at it, and while the Red Hood is a creeper he still pails next to Joker (who uses a crowbar a little too...well, I’ll let you discover that one yourself). 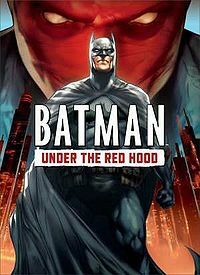 Not only is “Batman: Under The Red Hood” a good direct-to-video effort it would have made a pretty good theatrical release. While it’s not perfect it’s very good and it sets a new standard for what a direct-to-video film can be: Smartly written and paced if some God-forsaken effort was put into it. Parents, there is strong violence, gore, and mild language. Recommended for ages 14 and up.